It has been an astounding week. By the time of this blog’s publication on Tuesday, the festival will be over, we will have grudgingly and with heartfelt thanks sent the playwrights and actors home to their various cities, and we at Gulfshore Playhouse will be prepping for the start of rehearsal for The Mountaintop in a few short days. But at the time of this typing, we still have one more New Works Festival play to present, and I want to hold on to the festival for a little longer, so let me take this time and digital space to fill you in on the goings on this past week. The talkback following the reading of HARLOWE. We brought 4 amazingly talented playwrights down here for this festival, none of who had previously met each other. This is one of my favorite parts about doing festivals like this. Sometimes you are reuniting with artists you haven’t seen in years, sometimes seeing people you work with frequently, and sometimes meeting people who are new to your artist network. But immediately, everyone becomes family. And these playwrights, I can’t begin to tell you how much joy I feel at seeing them spending so much time together outside of our building and rehearsal. I hear about dinners they have had together, or time in the hotel hot tub, or walks to the beach, and I know they have found new friends and colleagues, new supporters, new structural pylons in the support system that is so necessary to artists in this business. They were arriving together at the Norris Center yesterday, the building where we have been rehearsing and presenting all week, all four walking down the sidewalk, and I looked out and said, “Look, a gaggle of playwrights!” And then, being playwrights, they all started coming up with various ideas about what a group of playwrights should be called. A gaggle? A murder? A brood? And then one tossed out, “An ovation of playwrights.” I hope we can offer this into the world as an official lexicological addition to theatrical (and perhaps zoological) terminology. In addition to all the amazing work happening in the rehearsals and performances this week, Gulfshore Playhouse started a new initiative that kicked off yesterday: STARwrights. This is a program spearheaded by our new Director Of Education, Leah Shaeffer. We have gathered a group of local high school playwrights that will meet with Leah all year, to focus on learning the craft of playwriting, culminating at next year’s festival, where they will present short works of their own. How cool is that? And throughout the year, we will provide them access to professional artists that can help them on this journey. Actors and directors that can talk about working with playwrights and new plays, designers that can help them hone ideas they might have about physical necessities for their plays, and of course, playwrights, living breathing, honest to god professional playwrights. And yesterday, that happened. Our ovation of playwrights was kind enough to come and sit with these young women (that’s right, all the STARwright participants are young women…put that in your pipeline and smoke it! ), and talk to them about their processes, their writing styles, the struggles of being a playwright, techniques, and answer the amazingly insightful questions these budding playwrights asked them. It was a total and complete blessing to be in that room and witness that yesterday. And then there’s the reason we are all here this week. That moment when all the work the playwright has been doing for years, when the week’s worth of rehearsals, the exchanged emails between directors and writers, the hours actors spent thinking and working on these characters, the thought and design put into organizing and promoting the festival, that moment when it all comes together and we throw wide the doors of welcome and the audience eagerly arrives, hoping and waiting to see something new take life before them. The Performance! The laughs, the sniffles, the gasps, the collective “oohs” issued forth, the coughs, the shifts in the seat: these are all data collected by the playwright, informing them of the state their play is in. What is working, what needs tweaking, what landed differently then expected? This is that magical moment, of which I have written in this blog several times, where play meets audience, where characters come to life, where the final piece of the puzzle is fit into place, and that thing that can only happen in a theatre occurs: a group of people, actors and audience alike, breathe together. Awesome. So, yeah. It has been a great week. The plays all got better. 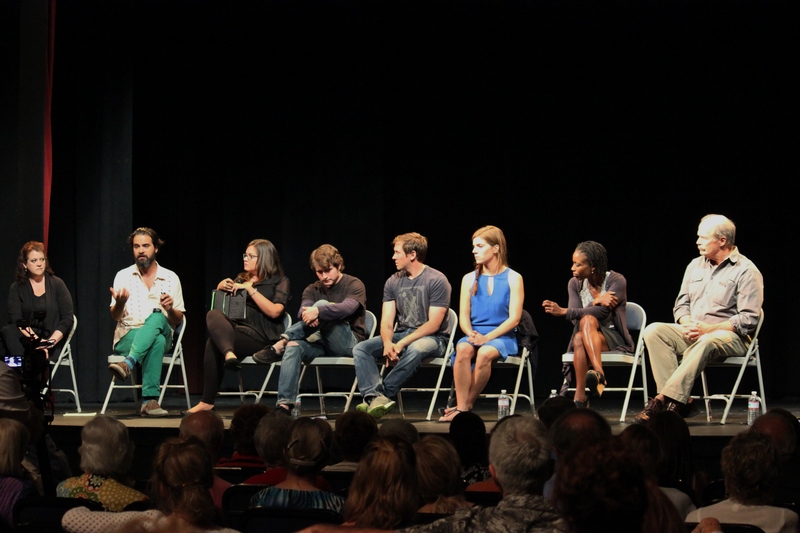 The playwrights, directors, stage managers, staff and actors all brought their A-games. And I can sit back (for one day at least) and cherish the knowledge that we send these artists back into the world feeling great about themselves and the work they did here this week. Doesn’t really get any better than that. Unless of course we can guarantee productions for all of these plays…so if you are looking for new work, hit me up. I got four great plays for you to read. Put ‘em on your stages, in front of your audiences. Y’all won’t be disappointed.